GigaWorks S750: Good sound; reasonably powerful; two-way satellites; control pod and remote control; M-Port digitally streams audio from some Nomad MP3 players. GigaWorks T40: Stylish mini-tallboy PC speaker with high-quality dual midrange drivers; easy access to volume, treble, and bass controls; headphone jack; provisions for optional iPod dock. 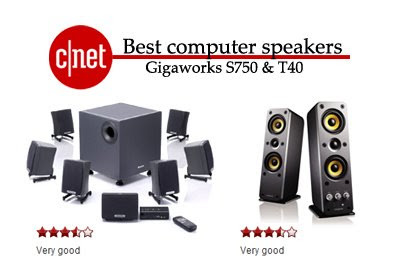 The T20 and T40 are great speakers I heard. But not so for the S750, heard a few negative comments like drivers not working. Creative is not going the right direction for speakers, if you ask me. Look at logitech, the king of the hill, the Z-5500. Creative needs a beautiful and cool looking, bombastic 5.1 speaker. Not everyone can afford the space just for wires.